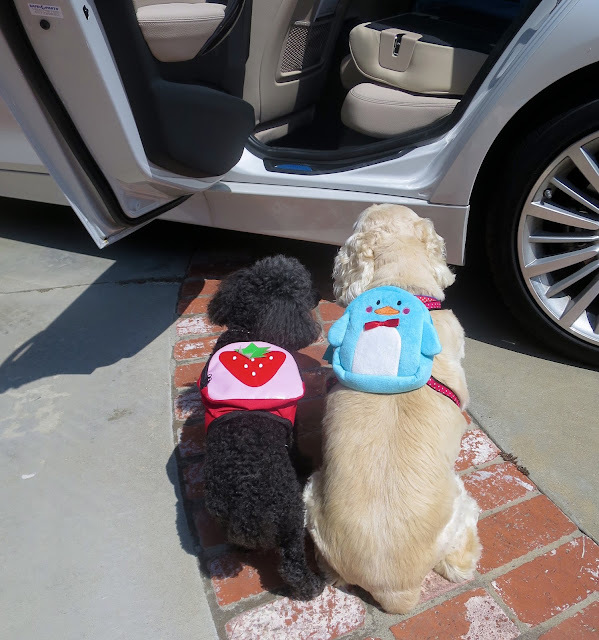 Paws Reports: Road Trip ! Annie and I are so excited! We are going on a road trip! I made sure we were prepared with new back packs. I got Annie a penguin to keep her treats in. I got myself a fab pink strawberry backpack to keep some snacks and my tiaras. Stay tuned for my road trip posts! Rosy this sounds like a fun new adventure! I'm looking forward to your road trip posts. The backpacks are adorable! I bet you packed lots of good stuff. Thanks! We love our backpacks! And we packed my Disney Princess duffle with everything that didnt fit in the backpacks. BearHUGS & RosyPoodleKisses! Rosy, where did you get those cool backpacks?! Mom says one of her favorite books was John Steinbeck's "Travels with Charley"--she says Charley was a poodle. Well I haven't read it, but looking forward to seeing your posts. Wishing you, Annie and your family a great, safe trip! Mommy seems to find everything on Amazon! And next she will get us that book! It sounds fab! Thanks for the recommendation! BearHUGs & RosyPoodleKisses! Well, this is a first for me! Entering my comments in Bob the Big Golden's "Reply" section. Sorry, Bob! Who knows what I'll do next, lol. You guys are having so much fun with all your special toys and get-ups, I almost wish I were a dog...Although, being a cat with my mom isn't so bad either; but because of my sensitive tummy, I get no treats-ever. Just boring vet food. Wish I had known my mum when she lived in La Jolla (but I wasn't even born then). Best wishes on your trip, Pasha.